This post has been sponsored by Twinings of London in partnership with the Mom It Forward Influencer Network. As always, all opinions expressed here are my own. I’ve spent the last six years traveling all over the world, backpacker style. Backpacking by definition, means literally everything I own has to fit in a backpack, and I made the decision to purchase a 38 Liter carry on backpack back in 2012 so it’s not even that big of a bag. Needless to say I’ve been living a seriously minimalist lifestyle for years. I’ve traveled to over 50 countries, and have been to almost every continent (sans Antarctica), all the while only having 20 pounds of belongings with me (I’m talking one pair of pants, one jacket, a few shirts people!). While I would love to have a full wardrobe of clothes with me, once you realize you have to carry everything on your back at all times, you immediately change your tune. It’s been liberating to live this minimalist lifestyle. I have spent close to zero dollars in the last few years on clothes, jewelry, housewares, random clutter, etc. What I have seriously indulged in is experiences and food. These are two categories that mean more to me than anything, and by minimizing my purchases in all the other categories to the bare minimum, I’ve been able to spend more on the things that make me the most happy. Naturally, I always save a little bit of room in my backpack for my dining favorites – namely, salt, spices and tea. Basic cooking ingredients I can buy on the go, as well as prepare meals as needed, but I always have to have salt, a few key spices, and tea with me. I do not want to be caught off guard without those. When I’m traveling in a cold destination my carefully stashed away tea bags save me from cold bitter mornings. Meanwhile, even in summer spots, a warm cup of tea is the perfect start and end to my day. 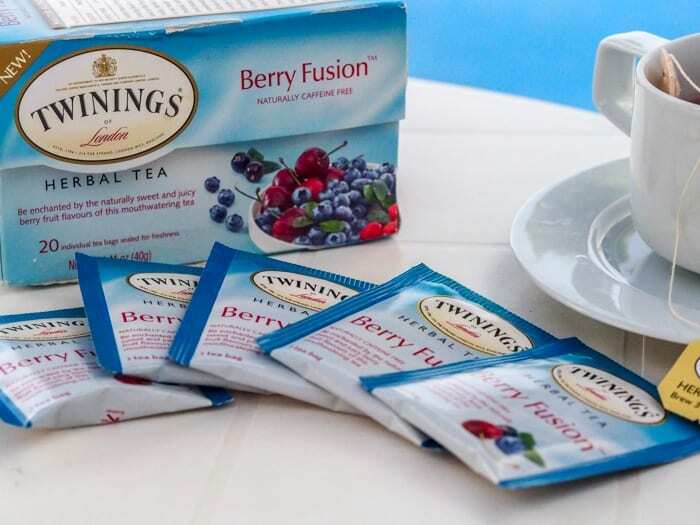 Currently in my bag I’m traveling with the+ Twinings of London herbal tea, specifically the Berry Fusion blend. Herbal teas are my favorite because they are caffeine free so I can enjoy them both in the mornings and evenings! Some fun facts; Twinings of London has been around since 1706, when Thomas Twining opened the House of Twinings in London with the vision to sell only the finest teas, herbs and infusions. The teas start with the finest ingredients sourced from all over the world. There are nine Twinings master blenders who travel the world to find only the best teas, spices, herbs and fruit infusions available. If there’s a job opening in that department I know I’m qualified based on the sheer volume I’ve drank. 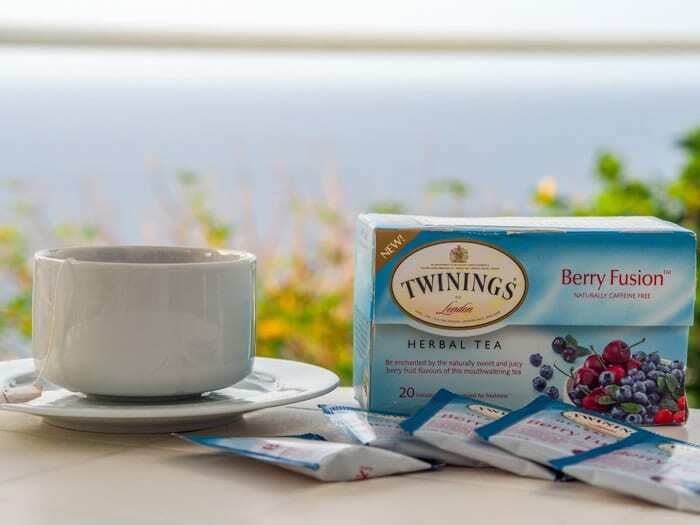 The latest Twinings herbal blends include Buttermint, Lemon Delight and Berry Fusion. If you’re looking for some different herbal blends there is a range of 17 to choose from. 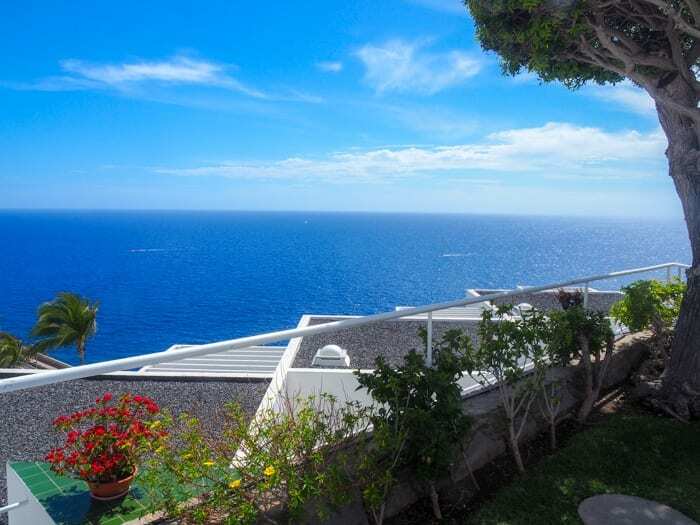 On a recent trip to the Canary Islands I fully enjoyed long mornings seated on my sea view hotel balcony gazing out at the unobstructed ocean view with a steaming cup of Twinings tea and my kindle. While it’s easy to get caught up in a constant cycle of never ending shopping sprees, I find it a lot more fulfilling to spend that same money on experiences instead, which I’ve been able to enjoy all over the world on a budget. With a cup full of tea in hand I’ve been able to start my mornings in all corners of the world, truly living my best life. I like to limit my coffee intake to 8 ounces per day, so I drink twinings herbal teas for the remainder of the day. i drink chai tea and sleepytime tea. I also love any kind of Earl Grey in the mornings! I like a number of different teas especially, herbal and red rooibos tea. I love tea, and I think my favorite would have to be green tea! Love herbal teas and am looking forward to trying a couple you mention that I did not know about. Buttermint for sure. My favorite tea is Chai with milk. My favorite kind of tea has been decaf green tea for many years. I have just started drinking chamomile tea. My favorite tea is red rooibos tea. Chamomile tea is my favorite!